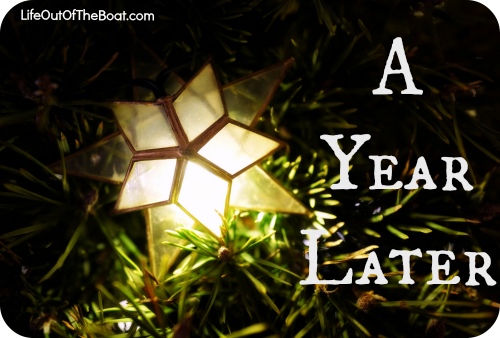 The night before Christmas Eve I was in a minor panic. Alright, let’s be honest… I was a hot mess. There was so much I wanted to get done before Christmas… how was I supposed to get it all done? The house was a disaster, there were gifts to be wrapped, and we still had not decided if we were going to brave the overflowing 5:00pm Mass or try our hand at the 10:00pm Mass with two little ones (under two). When we finally got our toddler in bed and the baby settled, all I could think about was how much we still needed to do! All the cleaning… all the wrapping.. all the things! Michael did his best to try to keep me calm and reassured me that even if all the things didn’t get done, Christmas would still come and we would still be fine. But all the things we need to do!!! Before I finally went to bed, I made a long list of all of the things that (I thought) needed to get done before we went to Christmas Eve Mass. There was laundry, the kitchen, presents for my husband and the kids, presents for our godsons that needed to be wrapped, we needed to go up to the Church to help put some things in the pews in the morning, we needed to prep things for Christmas morning breakfast with friends, oh yeah and at some point in the day I needed to shower and wash my hair. List maker that I am, writing everything down was helpful in the sense that I knew everything I wanted to tackle on December 24th. We’d wake up and start doing all the things, because all the things needed to get done. Christmas Eve morning, after what was probably a rough night of sleeping for me and the baby, I woke up to the happy shouts of our daughter, Alexandria, standing beside the bed. “Hi Mommy! Good morning!” It’s worth mentioning that Alexandria is the happiest morning person I’ve ever met. I have no idea where she got it from. Just before my mind could wander off to my “things to do” list, Alexandria got very quiet and wiggled her way into the blankets. “Nuggle?” (Snuggle) she said, resting her head against me with her arms around my side. And for just a minute, maybe longer, maybe less, this incredibly busy little person was just with me. No demands or commentary. She just wanted to be with me. It was amazing. And as a Mom it was one of those moments you try writing on your heart so you never forget it. Then, just as quickly as the moment came, it was over. Alexandria sat up, mumbled something about needing to see Daddy, and she plowed her way over my belly, slid off the bed, and ran on to the next pressing thing on her toddler agenda for the day. And then I remembered my moment with Alexandria, specifically how as her Mama I really enjoyed that rare quiet moment with my child and how I wish it had lasted just a little bit longer. Ah yes, I see what you did there Lord. How often do I dive into the “To Do List” without starting my day with God? How often do I quiet myself long enough to just be with Him? No demands, no commentary, no agenda. Just me and Jesus. When do I make time for that kind of silence? I’m still adjusting to this role of being a wife, mother of 2, and working full-time. 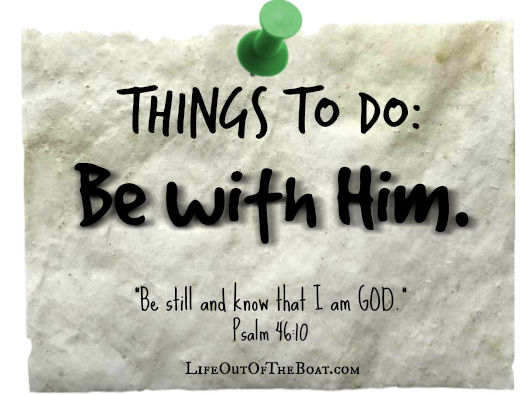 If there is one thing that I know I need to focus in this New Year it is learning how to just be with Him. Whether it’s a silent moment in prayer before the kids wake up, or time in the adoration chapel, there has to be time to just sit with the Lord in a quiet space. Yes, there are certainly times for giving the Lord our long list of intercessions. And of course there are times when we need to quiet ourselves so we can hear what the Lord is whispering on our hearts. But there is also a need for that sacred silence, those moments where we just sit with Him. We look at Him, and He looks at us… nothing more is needed than to rest in that moment. There are plenty of things that I know I’d like to do in this New Year. It’s tempting to make the list and run forward without a second thought. After all, there is SO MUCH that needs to get done right? Cleaning, unpacking, organizing, finding time to exercise, keeping the family watered and fed… all the things. There’s a time for list making and goal setting. The start of the New Year is a great time to do that. But in the midst of all the making and doing, let’s find time to just be with Him. It could be the most important thing we do this year. December 15th marked one year since the miscarriage of our son, David. Throughout the day I struggled to pin point exactly what and how I was feeling. There is a sadness there, of course. The details of that day are still a vivid memory for me, some parts of it being more painful than others. There is a sadness, and yet there is so much joy in our home right now. Simon is our “rainbow baby”. And while I’m not crazy about the term, I do acknowledge that there is something very special about the baby you have after experiencing a loss. I keep thinking that Simon wouldn’t be here if we had not lost David… and I’m so grateful for this beautiful baby boy. However, I still miss the baby I never met, the child I never got to hold. So on December 15th of this year there was an ache, a sadness, but also gratitude for the healing that has taken place in my heart since then, and for the gift of my son, Simon, who I believe was given to us for a very important reason. Over the past year, I’ve met so many women who have experienced child loss of some kind. I’ve been connected to women who had miscarriages similar to mine, women who lost their babies even later in the pregnancy, and women who have had multiple losses. This is not a cross any of us would have chosen for ourselves, and I think we all recognize how a loss like this changes you forever. Everyone’s experience is different, everyone’s journey towards healing is different… but we share that same ache and longing. A year ago I was hurting physically, emotionally, and spiritually. I was grieving. At times I was so angry at God that I couldn’t participate in Mass without crying. I think part of me was also afraid of what this meant for our family’s future. A year later, the ache is still there. But the pain is soothed by the joy and blessing of our son. In no way is Simon a “replacement” or a reason to forget the baby we lost. I think Simon is a reminder that God hears the ache of our hearts and He answers in His own perfect timing (which makes Simon’s name extra meaningful!). I know there are many families right now for whom the pain is still very raw. There are couples still waiting for their rainbow, and others who are struggling to find peace within the ache. Our journeys, our stories may be very different. But please know that I am thinking of you and praying for you, especially during this Advent and Christmas season. God hears and God answers. And His timing is always perfect.